We have two amazing foods in abundance right now…. 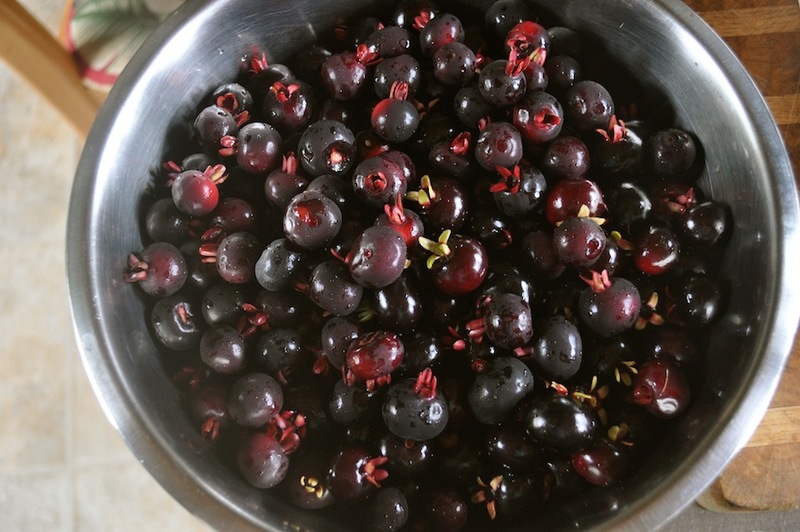 We have been enjoying eating LOTS of these two lovely fruits…and finding new and fun things to do with them. The vegan chocolate avocado cake with avocado frosting was a favorite, as was the avocado pound cake with brazil cherry compote! We are also getting a lot of great greens from our gardens. So we have a salad with every dinner, with greens like arugula, brocoli rabe, napa cabbage, okinawan spinach, and kale. And as of today, we have so many bananas! Our friend Forrest went on a banana hunt, and found 3 large racks of bananas. So I bet we will be making some banana bread in the near future! It’s great just being involved in the cycles of the fruiting of the trees. We work with what is fruiting, and try to wait patiently for the next abundant crop. We are so grateful to always have greens growing in the garden year round, to harvest from daily…Yum! We’ve been blessed this new year with amazing weather. Because of this, we spend most of our time outside! Jumping under rainbows, playing in the pond, working in the gardens, playing with the goats…Ah, we have been enjoying our days! Our goat herd is now down to a very manageable size, since we moved six young goats on to their new home. We now have a total of six goats; 5 nannies and 1 whether. We are milking four goats now, and getting approximately 2 gallons a day. I end up spending a lot of time in the kitchen, processing milk into cheese, keifer, yogurt and buttermilk. I’ve also been making kombucha tea, sourdough bread, and sprouting beans. We have a very productive kitchen at present! Our garden is getting some much needed attention lately. A lot of our greens are coming to the end of their production, so we’ve been making new beds and transplanting starts of kale, leeks, arugula, lettuce, and other various veggies. We have some good friends here now, and they are full of great ideas and enthusiasm! I’m enjoying planting some things in my small garden boxes behind my house, and I’m watching some beloved herbs start from seed. They are taking their sweet time, but I look forward to when they are mature and we have lots of herbs everywhere…Borage, parsley, lemon balm, catnip, sage….The more herbs, the better! 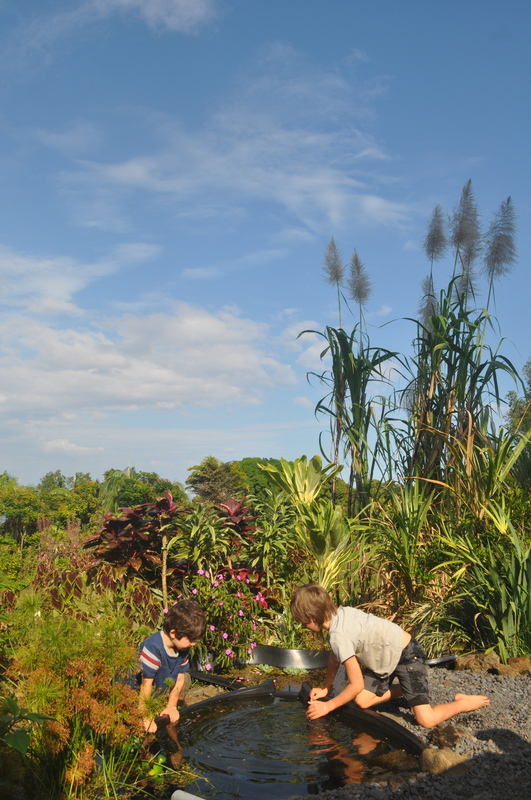 We are very busy, with farm duties, family life, homeschooling, and community connection. Sometimes it’s hard to juggle it all with finesse, but when I start to feel overwhelmed all I have to do is take some time alone outside. Whether it’s with the goats, sitting next to the little pond, or just lying in the grass looking at the sky…I feel rejuvenated and so blessed to be living the life I live! 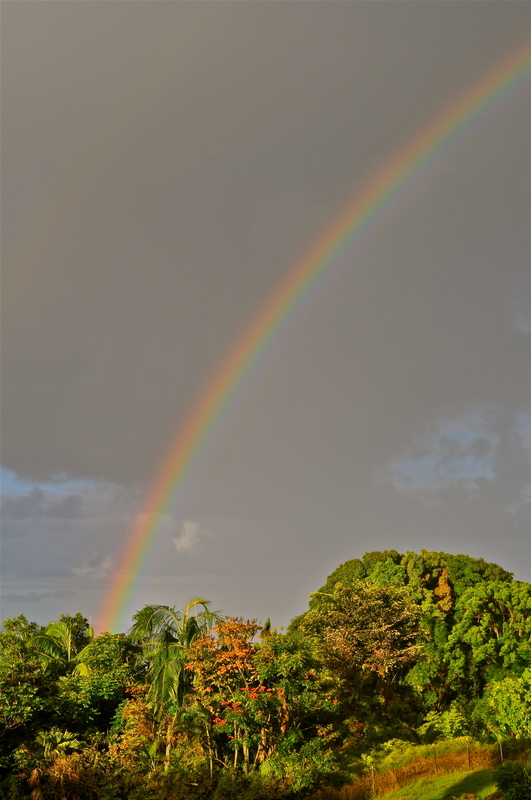 We’ve had a bit more rain recently, but with the rain comes beautiful rainbows! One of nature’s most spectacular shows, in my opinion. We always are delighted to see them, and they usually appear before the rain, so that when we spot one we know to run under cover! We really become one with nature, watching the signs and planning accordingly. I like to watch the rain clouds moving closer, and then I listen as the rain starts pounding across the land. This is when I run to beat the rain, and sometimes I win! Cloudy days bring a sense of calm, but when the sun returns we are delighted to run outside and bask in it. I try to find ways to appreciate the rain, since it can be so intense at times. When the rain is pounding on the roof at night, it is hard to get a good night’s sleep! And when the river starts running nearby, the intensity of the water is so strong. But this water, this rain, is really important. 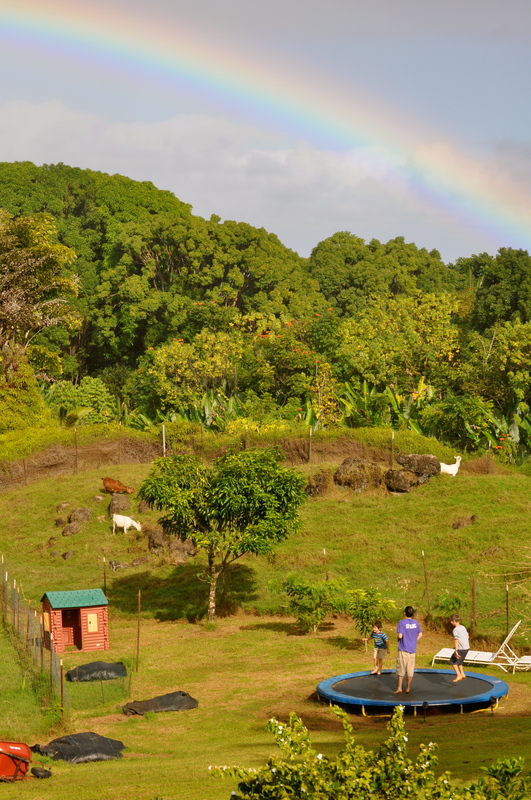 It brings such abundant life to this area, and is shared with the whole island of Maui. The East side of Maui, where we live, provides water to the West side of Maui where all the hotels and golf courses are. At present, they are diverting a huge portion of the water from this side to give water to these indulgent enterprises. The rivers don’t run like they used to, and this is effecting the ecosystem here adversely. There are campaigns fighting to regain the water rights for this side of the island. I’m hopeful that we will become more conscious of the long term effects that these choices will have on the environment. Rain. We have it in abundance, and we’re learning to love it! 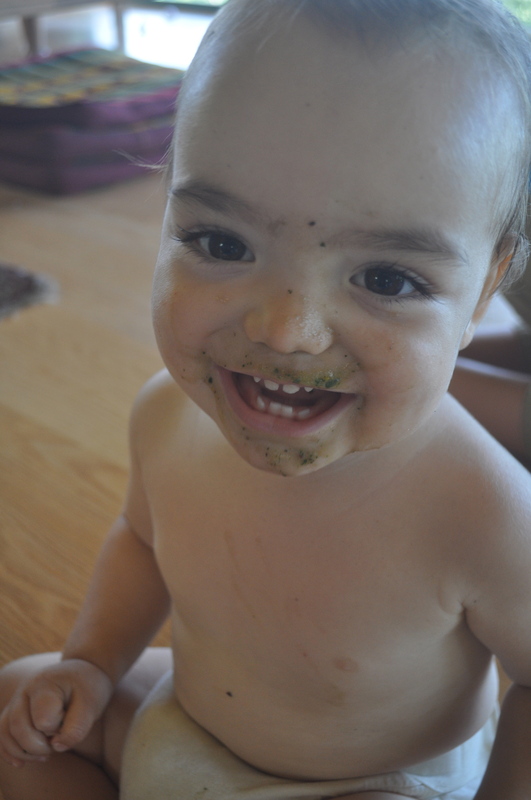 We try to make a green smoothie every day. It’s so healthy, and can actually be quite tasty! We stick to one basic recipe, but you can get really creative. Since we garden in Hawaii, we have a lot of jungle crops that grow year round. We add okinawan spinach, purple sweet potato greens, kale, begonia flowers (yes, they’re edible! ), and any other tasty greens or flowers that may be growing. 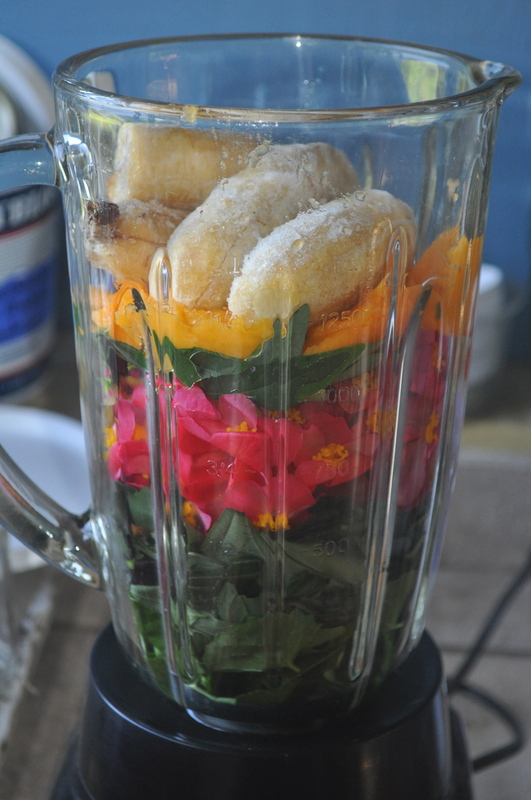 We also add approximately four (small) frozen bananas, half a papaya, one or two aloe leaves, and filtered water. 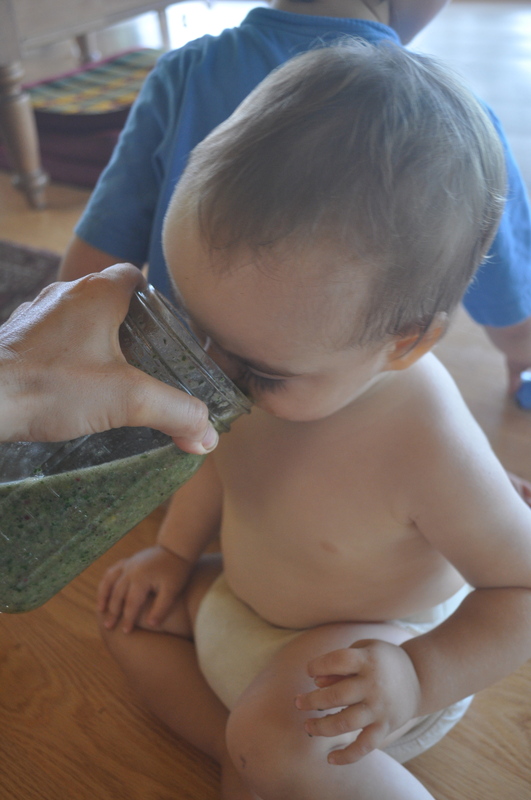 Then we blend until everything is finely chopped and well blended, and we’ve got our delicious green smoothie! It’s a great addition to your daily diet. There are some great benefits to drinking your greens. 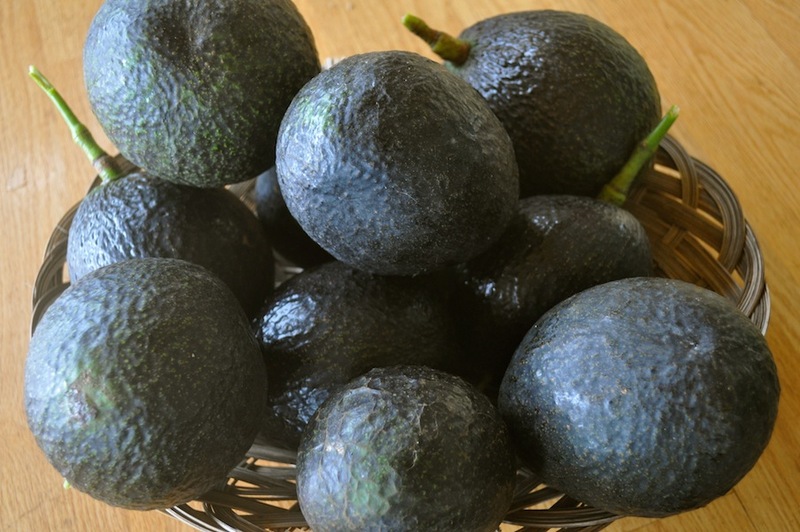 Since the blender chops them finely, it makes it easier for your body to assimilate all the nutrients, as opposed to when we chew them either in a salad or cooked. 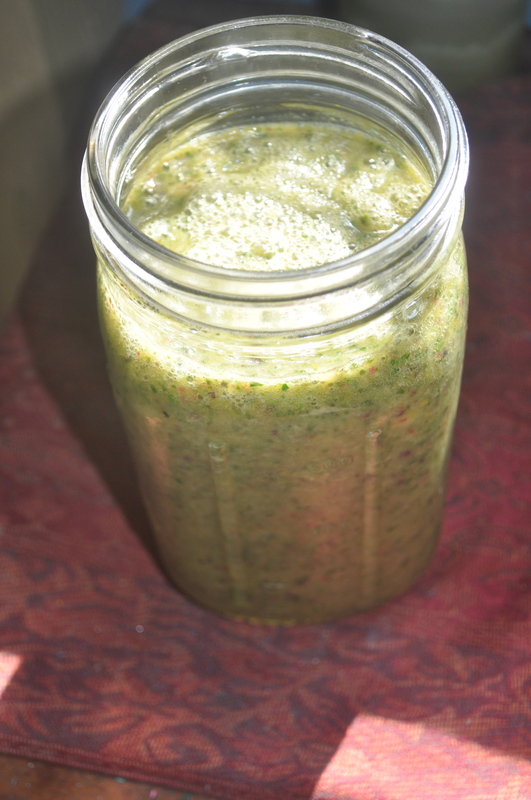 Do some research and learn all the benefits of green smoothies. I know we feel great when we drink one every day! Even my one year old enjoys them. He likes to share with me, drinking from a big glass! I can’t say the same for my four and seven year old boys, but at least I’m starting this one out at a younger age! Try a green smoothie if you haven’t yet. It could be great for your health! Ah, bread day. 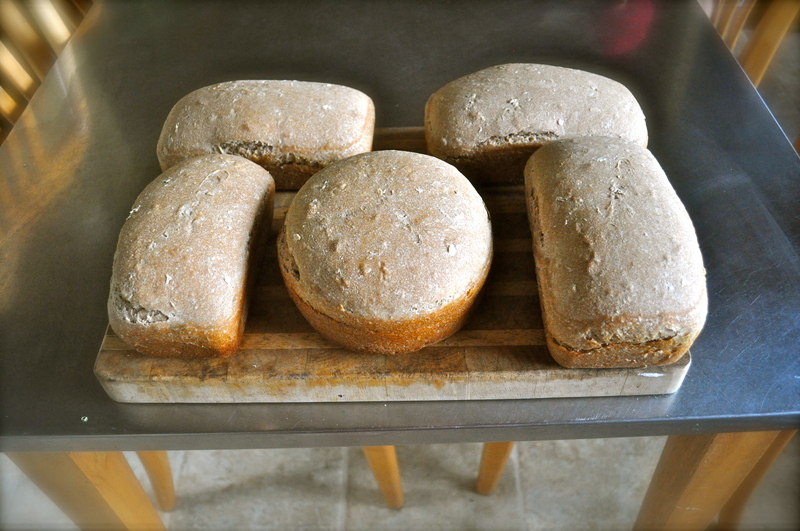 I’ve had this routine for awhile now, where once a week I bake our bread. It’s a lovely day, really. I take out the sourdough starter from the fridge the night before, and I feed it some flour and water, then let it sit at room temperature until the morning. It’s the most simple, yet gratifying experience. I add flour, salt, water, oats, flax, poi ( fermented taro root), or whatever else I may have, and then knead until I have a big, beautiful mass of dough! I let this sit for an hour or so, then knead again and shape into loaves…Then it goes into the oven, to cook until golden brown. We always eat one loaf right away, hot from the oven. My family loves this bread. It’s a big staple food for us, and I feel great about feeding it to my loved ones! Sourdough is such a classic, time honored process. Collecting the wild yeast from the air, and letting it do the job of rising the dough and making it taste so unique…This is something special. I love that you can take such simple ingredients and make a healthful, wholesome, nourishing food. And a fermented food is always the best for your body too. www.wildfermentation is a great website that goes into detail on the benefits of fermented foods. It’s a passion of mine, and knowing I do at least this one thing each week to create an enriching food for my family and me, makes me feel great! I ran outside with my camera to get a shot of this great spider, who made her web in the middle of our red hibiscus bush. I love how they make an X in the very center of their web. 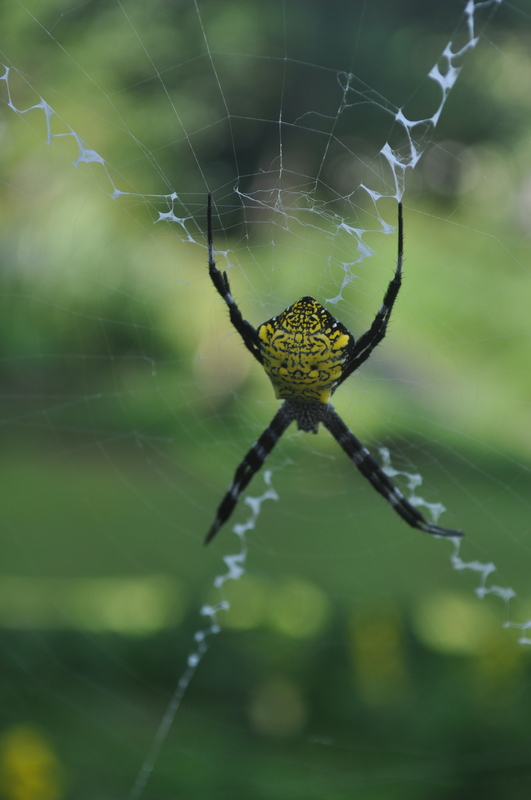 We appreciate spiders, since they help rid the garden of unwanted pests! We’ve enjoyed a beautiful Saturday. The weather was perfect, with plenty of hot sunshine and even a few small sun showers! Everyone kept busy all day long, doing small meaningful projects. Being able to spend most of our day outside is lovely! While the kids played, I planted a mango seed (from our beloved mango tree that we planted for our first son’s birth), and I also started some mamaki seeds. We have just begun to harvest fruit from our mango tree, which is now seven years old. We only have five fruit on the tree this year, so we watch each one closely as it ripens. We hope to see the tree bear many more fruit in the coming years, and we even planted a second mango tree next to the first for our third son’s birth, with the plan in the future to hang a hammock between the two mango trees! Yum! 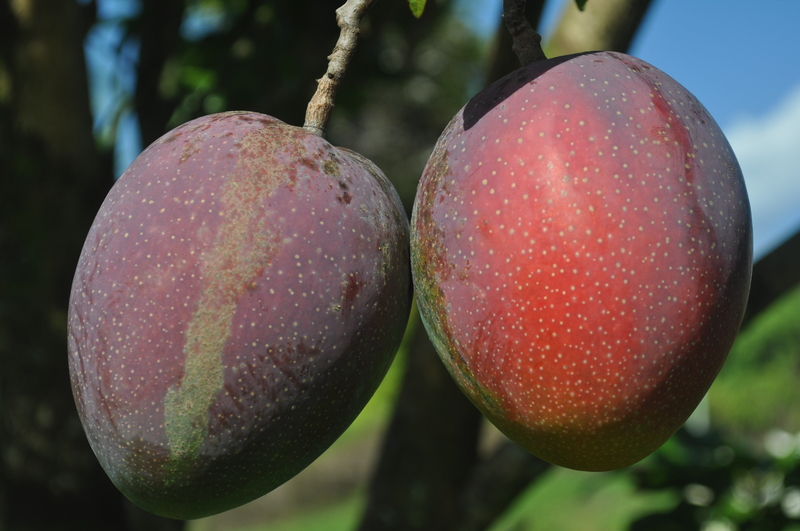 These mango trees are called Raposa Mangos, and are supposed to grow better in a wet climate. Mamaki is a great plant that only grows in Hawaii. I look forward to writing more about it later, since it is one of my favorite plants. It is similar to stinging nettles, without the sting! We harvest the leaves to make tea with them, and it is great for high blood pressure, among many other things. I’ve only just begun to try growing these plants from seed, so we’ll see how it goes. Our day has been full, and we have so enjoyed the sunshine after so much rain! Zeoc spent a lot of his day weed wacking and mowing, trying to keep up with the ever growing grass! We also find it very useful to collect the grass clippings to dry for mulch on the gardens. It’s looking beautiful here on the farm, and today has been just lovely.